Before I went to flipside and after I returned, I was inundated with questions from others. Everyone wants to know what this burning man thing is all about. Well, this was my first burn event and through the saga, I spent a lot of time pondering what it’s all about and what it means to me. My personal experience started back in January when I joined RedCamp. We worked for months of preparation. Last Thursday, we departed southwest Austin for Flat Creek, the next-door neighbor of Pedernalis falls state park. It was RedCamp’s second year at flipside. To celebrate, our infrastructure fateful constructed a cone-shaped, water-resistant tent. It was added to the parachute-covered dome from last year. Last year, RedCamp didn’t have (and didn’t need) the cone. This year, it was pretty much a requirement. We spent most of the day unloading the U-Haul as the sky looked ominous. We pulled out the cone and draped it across the cabling. Then, the heavens opened. I pictured the crew of a trans-Atlantic sailboat wrestling with the sail through a fierce storm. The wind pounded against the cone as we threaded the edge with a tent pole. However, it held up and RedCamp partied under it during the evening of storms that continued to pummel Pyropolus. I had erected a shade tent above my tent as protection from the sun. It too held up and I remained only damp that night. My neighbor did not as dripping came through her rain shield and kept her awake through the night. Friday morning was more of the same. Suddenly, we had a defector from Redcamp. Wet and tired, she went home to Austin with a questionable return date. I too was on the fence. The fact that I’m not one to go out of my way to have a bad time in the pouring rain for 3 days led me to consider a similar option of spending the night in my bed in Austin. Nevertheless, it wasn’t to be as the blue sky could be seen for the first time around lunch on Friday. RedBand started jamming in front of the dome as the traveling pantomime play was on the road in front of RedCamp. We provided orchestral accompaniment to the show. At some point, a pantomime girl hit a note on my keyboard in the middle of the play to make a sound. It was the root note of our improvisation and she wouldn’t take her finger away until I pried it from the keyboard. Cute. Shortly after, RedBand went on the march. We played the RedCamp theme and a random authoritarian lady led the way with a megaphone telling people not to park places (or rather, telling their empty cars). We meandered through various camps and DJ’s playing various grooves. We would alter our key and/or tempo to match the tune of the moment. The entire experience amounted to tuning our instruments to the collective consciousness that was around us. One DJ caught our attention and we strolled into his small dome. He incredulously looked at us and said, “You can’t jam here!” It was a good thing because that put us on schedule to rock out the Wonderlounge. The DJ there hooked us into his PA so each of us could be heard through a speaker. As we strolled back to RedCamp, the pantomime girl came by with the “pull my finger” trick. Again, she hit a perfect fifth and I let it ring. Then her face showed that she was ready for me to move it. After long delay, I grabbed it and made it play various other notes. She was only mildly amused as she yanked it and ran away. We then rounded the bend and a guy I’d seen in Austin during First Night shooting propane fireballs shot a fireball right in front of us. I got back to camp and traded my keyboard for a saxophone and headed up to the greeter station for Redcamp’s shift. At the greeter station, most of the RedCampers were in their true flipside garb. From red pubic hair to this year’s official RedCamp male uniform, “the Borat.” Unfortunately, I didn’t partake in that aspect. The attire was necessary for greeting. The greeter station is where you enter the world of Pyropolus. It a desensitization step that also introduces delay for the impatient. Also, the point is for greeters to ensure that everyone is prepared, such as having enough water. One guy came by with two models and was asked if he had enough water for the weekend. His reply was that he had the two girls and that’s all he needed. He got the green light. The next day began when two strolling bass players walked past RedCamp. I grabbed my battery operated Casio keyboard that I borrowed from my other band, Toast, and followed the bassists down Euphoria Drive. We jammed out to the various sounds around us and made our own grooves when others weren’t provided. Eventually, we ended up back at the Wounderlounge again but this time I deferred to the bass duo to hit up the PA. I then spent some time gallivanting through the circus that abounded. Often, I was a part of it as a minstrel. The smiles flourished in the carnival-like atmosphere. The thumping of trance music could be heard in all directions. I stopped by Whisky Lounge for some single malt and bourbon. Later, I ate a couple small pieces of meat at the barbecue (I’m kind of vegetarian). The people really make the experience at Flipside. Most people are here to meet others. On one end, people are extending existing friendships by camping together in a group. Putting together a theme camp really illustrates it because it is impossible to do it without preparation. This forces you to be together and creates a community-like environment. Once you get there, everyone else is in the same boat and it becomes a larger community or a city if you will. Part of it is also creating new relationships. These go from the one end of the spectrum of meeting someone you will know and keep in touch with for the rest of your life to a “hi, what’s your name? my name is …” Most people are there to meet others. I think it would also suffice to say that a large group of people are there to form sensual and often sexual relationships. As such, I think it would not be terribly challenging to do so if you were driven. A solid connection and meeting someone for a longer relationship may be possible, but I think that it might be more challenging. Many of the folks here are not from Austin. I met people from different parts of the country and even different parts of the world. There are 2007 life stories out there. On Friday, I met a trio of Danish folks coming to Pyropolus on the first leg of a trip including a wedding in New Orleans and ending in New York City. Another was a girl from Utah with whom I discussed the good and bad aspects of the influence of the Mormon Church in Utah. There, beer served in bars and grocery stores must be no more than 3.2% alcohol. Even Bud as a special formula just for Utah (and I thought Texas was unique cuz they got their own can). Consequently, this girl only drank, no other drugs. I might venture a guess that she was in the minority at flipside. As expected, pot smoking was abound and freely shared among fellow campers. The use of psychedelics was widespread. Some argued that alcohol is their least favorite drug. I can understand why when you compare the effects of psychedelics that alter the mind more than the body. Nonetheless, alcohol was pretty much everywhere as well (but you didn’t have to drink it, no means no). Among the use of MDMA and its derivatives, one popular method of mind expansion was to “hippy flip.” This involved taking a dose of magic mushrooms, then, when the effects start to develop, take a tablet of ecstasy. At this level, we return to the roots of tribalism, rites of passage, and a level of deep introspection. We have found the way to practice the rituals hidden from the culture of the western world that have been used by other civilizations for millions of years. To many though, it’s just about having a good time. Maybe there were little less than 2007 stories because of forecasted bad weather. The weather wasn’t all that bad though. It was definitely soggy, but there was no rain for most of the time, only a few big downpours. Most of the heavy weather was on Thursday. I think that it kept a lot of people away. It would have obviously been better without the rain, but I think it was really part of it. It made it even more of a rite of passage. Honestly though, I think god was smiling on Pyropolus because after it cleared on Friday, it only rained briefly during the wee hours of the morning on Friday and Saturday night (and a negligible sprinkle on Sunday morning). The ground was saturated though, and it was kind of a drag at times. However, again, I think there were higher powers involved, perhaps spoiling a little bit of hedonism in favor of introspection? It was an example of vibrations and the collective consciousness. I could tell when I was walking through the puddles; people were doing it and just dealing with it. Then, I might make a complaint and I could feel the other people’s vibes turn negative as they focused their thoughts on the inconvenience to which they weren’t paying attention until I mentioned it. The plan for Saturday was to jam at RedCamp through the night. Before this, I headed up to the rock opera with Bugaloo. It was well written and well performed. With some tightening, I think it could be ready for prime time Austin. After this, I walked with the ladies from Denmark and Bugaloo through the events on the Playa. I needed some water so I ended up by the camp with the big circle and the guy shooting the propane flame-thrower atop the bus. I asked a dude for some water. Ten minutes later, I was on top of the bus with the propane jockey while the kid that talked me into it jammed on my keyboard next to me. After this revelry, I walked down Euphoria Drive past the always happening Ish and heard drumming as I approached the RedCamp dome. Inside, I could see fire spinners. Then, I joined the jam with my keyboard and the party moved into the street. We jammed out with drums, guitar, and keyboard while the fire spinners took their turns dazzling spectators that formed a large oval around the scene, with RedCamp at the heart. The jamming continued until the last RedCampers standing watched the sunrise. Bugaloo told me it would be so but I didn’t believe that each day would get better. Sunday was the climax of the festival and of my understanding of it. It began with bacon and eggs from the newest RedCamper. It was a guy from some other camp that was so blown away by RedCamp that he decided to bring some stuff over and cook it. It was awesome. After that, a stroll through Pyropolus as the Casio minstrel ensued. I ran into a trumpeter and we headed down to the creek. We started to jam with the drummers across the river. Due to the slow speed of sound, I’m sure we threw them off as they heard the delay between the time they played and it hit our ears. Then for us to play along and send our interpretation back. I got lots of smiles and complements about the strolling and jamming. It felt nice to make people feel nice. I spent the rest of the afternoon getting some R & R at RedCamp with friends, eating some food from the new chef, and saving up for the night by watching ominous storm clouds roll into the previously sunny sky. After a slight drizzle, the weather cleared and Doctor Doobie was in front of RedCamp explaining his vision for the processional. We were concerned about the instruments so he guaranteed dry storage should rain erupt (it never rained again until a Monday morning drizzle). It sounded great to us, so we headed up to the processional meeting. It was then I realized that I had forgotten to acquire some mushroom chocolates from my friend. I headed back to camp while the processional meeting continued. My friend was putting on his war paint and it took him what seemed to be an exorbitant amount of time. Eventually, he pulled out the chocolates and we consumed the sacrament. Then, after some more delay in acquiring articles for him to join the processional, we were finally ready to go. Suddenly, his wife was coming, but had to first go to the bathroom. More delay and then the wife bailed and my friend took the back way out of RedCamp to meet me on the way to the processional meeting. The synchronicity continued. At the same time, the processional was passing RedCamp in such a way that my friend was left behind (as was probably best for his purposes) and I joined the front of it. From there on, it was Doctor Doobie’s Extreme Marching Band as we gruelingly walked the treacherously puddled streets of Pyropolus to spread the word that the burn was about to commence, and the residents should make their way to the Playa to watch a pyrotechnics display like none other. It was very much a challenge as we kept up Doobie’s breakneck pace through the streets. At times, it was hard to hear the other musicians over the steel drum keg, which packed a punch. At one point, we had to literally jump over a puddle to get to Get Lost and jam out there. As we arrived at Get Lost, the chocolates reminded me I had eaten them, and the challenge continued. It was Micro and Bugaloo jamming out Get Lost over the PA along with the DJ’s material. Eventually, we were ready to ascend to the Playa. We were told by one director to play “something ascending.” Red Tony came up with an anticipatingly ascending jam that was Dm-Em-F-G. It was perfect. As we arrived at the fire spinners in front of the Effigy, Doobie’s vision was complete. Red Tony, Bugaloo, and I headed back to RedCamp to drop off our gear. Micro continued to play at the Playa. Then, as the chocolates continued to grab hold, the most intense part of the trip (both the trip to flipside and the chocolates) ensued. The team each took a little green pill with an apple on it. The burn was about to begin. Before you even walk into the Pyropolus greeter station, you are given a waiver to sign which makes you responsible for your actions instead of someone else. Right of the bat, the limits are no longer there and free to be tested. For example, if you get wasted and fall off a cliff, or fall off the huge pyramid you are allowed to climb (or fire-breathing bus you are not allowed to climb). Of course, the fire patrol is there and there is a strict line around the effigy that cannot be crossed until the effigy falls to the ground safely. However, the line is pretty close, and there are lots of people standing around. The burn itself is an engineering marvel. The effigy is designed in such a way that there are a series of events triggered throughout the process. First, a small piece of something burning is thrown into it. A little propane, and suddenly, the effigy has caught fire enough to where a hammer suspended by rope is burned. The hammer falls into a trigger that launches huge amounts of propane into the structure, and a wave of fire erupts. Suddenly, implanted fireworks start shooting out of it and little pieces of it into the crowd. My friend got beaned in the forehead. I knew to stay back to begin with (chocolates, perhaps?). Remember, you make your own limits in Pyropolus. I think no one was hurt. From there the effigy burned until at some point, part of the structure snapped. This triggered the next phase of the display wherein a level of it collapsed. The crowd cheered vehemently. The burn continued. Finally, a third collapse causes the entire effigy to drop to the ground, and suddenly the artificially imposed limits imposed by the fire chief are removed. The burners circle the fire in a display of release as the ritual of flipside climaxes with its most symbolic aspect. After the burn, we checked out the Maestro do a little beat boxing on the huge pa hosted by the camp with the propane jockey and the circular projection screen. I then got to witness some folks enjoying the invigorating aerobic workout that can ensue after a little “e” and some throbbing, pulsating beats with rich, fat synthesizers. The crowd is also very “huggy.” This is something I don’t mind at all. Hugs are the best thing going. I was on my way down from an experience that involved a lot of growing, talking, introspection, and outrospection. I headed back to RedCamp to whip up some final jams before we had to depart Pyropolus the next morning… er, when we got up, for by this time it was after 2. I strolled into Ish and saw my friend. I thanked him for the chocolates and he asked me if I wanted any more. I told him that I had had all I needed. 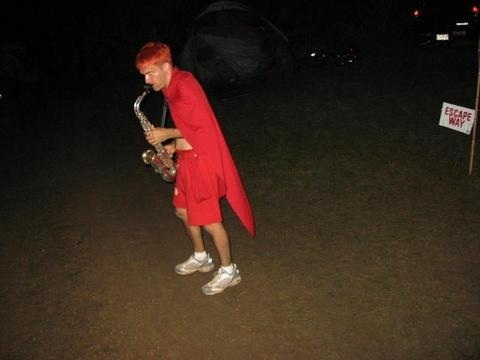 I walked back to RedCamp and grabbed my saxophone. Red Tony was out for the count on the chairs at Ish, but Bugaloo and some other drummers were back at RedCamp. We jammed out some tunes. Between times, I’d wander back to Ish, at times playing along with their DJ. Eventually, I ran into nobody and the night was complete. I went to bed for 4 hours. Monday morning, Memorial Day, my 30th birthday, had arrived. It was time to clear the wreckage. As usual, the U-Haul did not start. Simultaneously, another guy noticed that his tire was flat (synchronicity). We tried to get a jump from a dude in a mustang, but we didn’t want to hold him up, so we called upon the Gator Rescue. We rolled up in his 6-wheeled golf cart as he followed in his “dooley” pickup (4 back wheels). He jumped the steaming pile of U-Haul and we were on our way to RedCamp. I guess it was karma because we had to load the water-logged “toxic-waste” carpets that lined the floors of RedCamp through the festival. I then returned home, only to stop for a 4pm lunch at the Nutty Brown Café. Then, I wrote this. Now, I’m jumping in the shower because RedCamp hasn’t called me to dispose of the carpets, so I’m hoping it is a birthday gift. First and foremost, flipside is about camping. Right off the bat, we’re in an environment that is not going to be the most comfortable and convenient. Many people like camping, but others (even myself) consider it a mild inconvenience endured for the sake of nature. In the case of Flipside, four-nights of camping is the foundation for a new world outside of the day to day world in which we all live. This prolonged exit from normal reality is necessary for the full effects of the experience. Camping is one thing, but even more fundamental to the concept of a burn event is a social experience between people in a community. There are different types of people in the community, but everyone is forced into being together for a higher purpose. Everyone has a role. This is especially true when you have theme camp. However, when you come out at the other end, you realize that all that energy expulsion is a good thing and will be rewarded. In some cases, the people of the tribes are trying to connect to a higher power that can not yet be explained by science, or a spiritual awakening we are lacking in our Western world of capitalism, egoism, and the constant battle to keep up appearances. Also, there are those that just want to have a good time and forget about everything else. In my case, it is about musical expression. Flipside is a blank canvas on which everyone can paint themselves in any way they wish. Everyone has a role. There are no spectators. There are lots of preparations that go into flipside, but there is a higher power at work. As Macro once put it, “If you get a large population of people where a significant percentage of people are tripping, interesting stuff is bound to happen.” However, that is not required. Improvisational music is the best example of this. Another is the synchronicity. Another is hugging, and yet another is giving. Above all, it is about you and your interactions with other people and where you fit into the experience that is the Burning Flipside. In the end, only you can decide what it is all about. Often, it is about something you can’t predict. In my case, one of the things I’ve realized about myself is that I’m not as accepting as I should be. At an event where it’s all about giving, sometimes you need to accept the generosity of others. Of course, no means no, but why say no to kindness. Light a sparkler someone gives you. Take a puff. Have a shot. It makes people feel good to make you feel good. I usually pass because I have my own very strict opinions, especially when it comes down to what I put in my body. One shining example was that I didn’t actually end up eating any of the birthday cake that was provided to celebrate my birthday because I was anti-sugar. Maybe I should take one for the team and have a slice… or at least not write about it so everyone knows.